The Province of Udon Thani in northeastern Thailand is beset by many water resources challenges, including severe droughts and floods compounded by urban and economic growth. 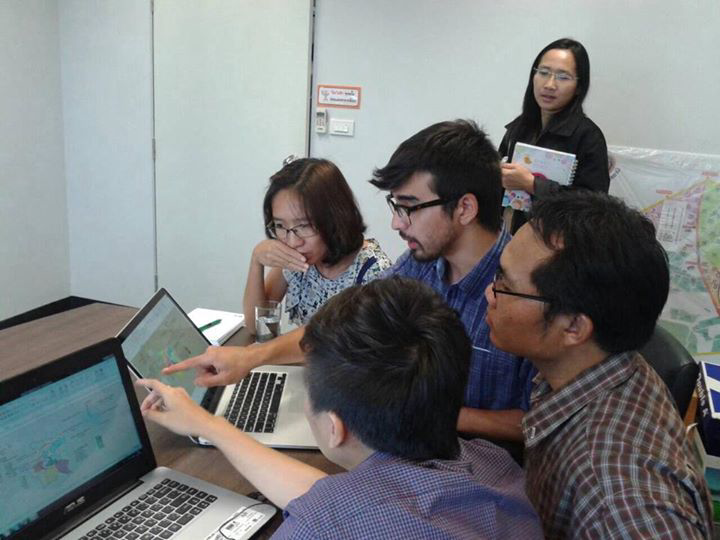 In response to a request by the deputy Provincial Governor of Udon Thani, and with support from USAID, ICIWaRM engaged in specific collaboration tasks throughout September in preparation for an Inter-Municipal Flood Risk Reduction strategy dialogue using Scenario and Shared Vision Planning, held on 24-25 September 2015. The Dialogue was led by ICIWaRM and a “core team” of Udon Thani professionals. ICIWaRM’s team was led by Guillermo Mendoza with assistance from John Kucharski, USACE Senior Economist, and Sean Chen, a Princeton University Scholar in the Nation’s Service Initiative (SINSI) fellow. Sean Chen (IWR/ICIWaRM) and the members of the Udon Thani core team evaluating potential planning alternatives. – interviewed key professionals in the region to understand opportunities and challenges to institutionalize the scenario and shared vision planning process. The Scenario model decision interface (in Thai) to explore first order Flood Risk Management actions needs and impacts across municipalities within a future 2nd ring road. The workshop incorporated landscape designs aligned with regionally defined “livable cities” goals. EstudioOCA, a global design firm focusing in landscape architecture, urban design & planning, helped highlight the social and environmental benefits of functional flood risk reduction designs with architectural renderings of key locations for implementation. The SVP model was used to determine “optimal” solutions by each municipality to address flood risk due to urbanization and climate change. The different “optimal’ solutions created by the different parties illustrated the challenges ahead.